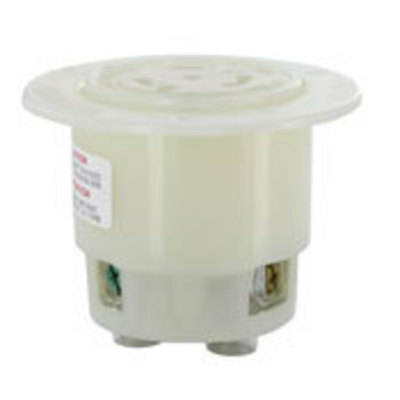 Detailed Description: Leviton 3-Wire 2-Pole Flanged outlet locking receptacle in white color features a durable nylon face and body construction with thermoplastic nylon strap for added strength. The 1-Phase receptacle operates at voltage rating of 125 Volts and current rating of 15 Amps. It offers better performance and long lasting reliability. 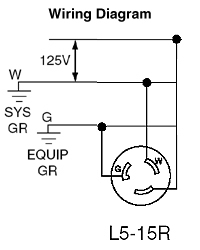 Receptacle works at a power rating of 1/2 hp. It has 0.35-Inch thick solid brass line contact. 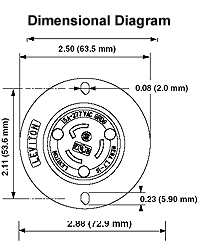 Receptacle measures 2.500 Inch diameter x 1.78 Inch. It is ideal for industrial or industrial applications. Receptacle features terminals of brass - hot, green - ground and white/silver - neutral for easy terminal identification. It accommodates 18 - 10 AWG terminals. It withstands maximum temperature rise of 30 deg C after 250 cycles OL at 200% rated current. Receptacle has back wired termination. Receptacle has permanently marked ratings for easy identification. It features terminal brass screws of 10 - 32 inches and grounding brass screws of 8 - 32 inches for easy installation. It operates at temperature of -40 to 60 deg C to perform efficiently. Receptacle withstands up to 2000 Volts dielectric voltage. It has UL94 V-2 flammability rating to withstand harsh environmental conditions. Receptacle conforms to NEMA 5-15R, UL498, ANSI, NOM and CSA certifications. Commodity Description Gen Purpose Wiring Devices - Plugs, Conn, Inlets, Etc.